Seoul: Asian technology companies came under pressure on Thursday to slash prices of their tablet computers after Amazon.com launched its Kindle Fire at a mass market-friendly $199. From Samsung Electronics to Sony Corp, major Asian tablet makers have ambitious plans to take on Apple, whose iPad is the gold standard in the booming market. The South Korean company’s tablet marketing campaign has also stumbled in recent months due to Apple’s legal attempts to ban Samsung’s tablet sales in Australia, the United States (US) and Germany, over patent infringement, among other claims. 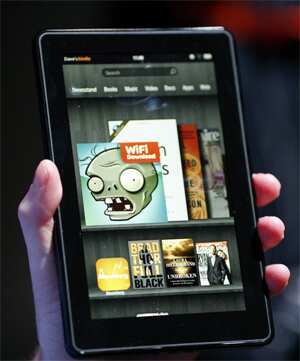 The Kindle Fire, while lacking many of the high-tech bells and whistles common on tablets from cameras to 3G wireless connection, may sound the death knell for a raft of devices based on Google Inc’s Android operating system. “The pricing is critical to gain traction in the tablet market. Rival manufacturers have failed to attract consumers as they have matched the iPad’s price point without matching its content offering," said Adam Leach, an analyst at research firm Ovum. “Amazon’s retail-based business model allows the company to subsidize the device on the premise that consumers will buy more from Amazon, be that physical goods or its digital content." Samsung’s Galaxy Tab, Sony’s S tablet, Motorola’s Zoom and many others from Acer Inc and Asustek Computer Inc all run on Android, which Amazon’s Fire also uses and combines with its online store. By pricing the Fire at less than half the iPad - yet stripping out costlier components and features - the internet retailer hopes to get the device into millions of consumers’ hands and then into Amazon books, movies, music and other content. Samsung’s new tablet Galaxy 10.1 is priced roughly the same as the iPad. Even at that price, a slim profit margin of around 5% makes it difficult for Samsung to cut prices sharply, analysts say. Worldwide tablet shipments will more than triple to 60 million units this year and surge to 275.3 million units by 2015, research firm, IHS iSuppli, forecasts. Apple dominates the North American tablet market, with 80% of the 7.5 million units shipped during the second quarter of 2011, strategy analytics says. Analysts had expected Amazon’s tablet to be priced around $250, roughly half the price of Apple’s iPad, which starts at $499. Sony vowed in January to become the world’s number two tablet maker - behind Apple - by 2012 and Sony executives have since stuck to that ambitious claim. “We expect the Amazon tablet to put pressure on the other non-iPad competitors as they are unlikely to be able to compete on price and value," UBS analysts said in a note. “At the $199, we believe Amazon’s tablet has the potential to be disruptive to the market and, in particular, the non-iPad market. Other tablet vendors will find it difficult to match Amazon’s price point." HP’s firesale of its TouchPad tablet at $99 just six weeks after its launch created strong demand for its soon-to-be-killed product, a sign of just how critical prices are in the sector.